Debbie will greet you at the front desk. If you’ve filled out your new patient paperwork ahead of time–great! If not, she’ll give you the forms you need. Please note, it is extremely important that your health history is filled out completely. We know it can seem time-consuming, but it’s important for Dr. Murray to have a full view of your health–including those vitamins you sometimes take, or the surgery you’d like to forget! Debbie will also make a copy of your insurance card, and can answer any questions you have about your coverage. 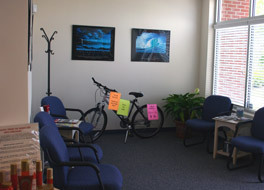 Have a seat in our sunny waiting room and we’ll call you back for your consultation and exam in just a moment! During the consultation and exam, we will review your history and areas of concern with you. This will help him customize an examination to determine the cause of your problems. If any x-rays or other tests are necessary, those will be done. If you need immediate help, some type of treatments may be done that day. But typically, your exam findings, and your first adjustment will be done during the second visit. At the front desk, Debbie will answer any insurance or payment questions you have and she’ll schedule your next appointment and give you an appointment reminder card. Appointment times are spaced to give every patient the personal attention you deserve- so please help us by being prompt or giving 24 hours notice if you can’t make an appointment time. Contact Chiropractic Works now to schedule an appointment.